Gun Safes: Ratings and Certifications Are you being bamboozled? 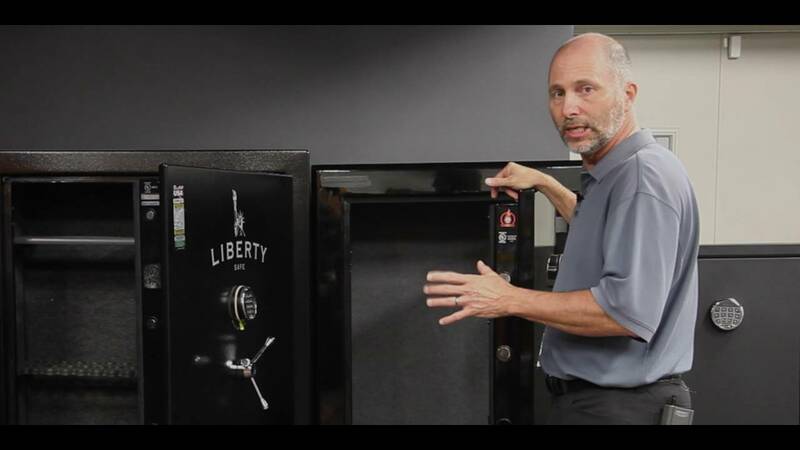 In this video, learn about gun safes, the gun safe industry, ratings and UL certifications. Gun safes are marketed and sold on security perceptions, not on hard facts and actual certifications. We try to present accurate and informative material to allow you to make an educated decision based on facts and not on preconception and emotion. The first thing I want you to look at is UL-listing. Most gun safes are built to UL – RSC Certification. Manufacturers use UL listings as a selling point, but what does the”RSC” rating actually mean? UL-listed RSC also called “8M10” stands for “Residential Security Container”. This does not sound very secure and for good reason. These are not Gun Safes. This rating was created for a family of products that do not meet the minimum standards for a UL Certified Safe. The RSC Standard was designed for inexpensive steel cabinets. The RSC certification requires that they block access for five minutes using a pry bar less than 18 inches long and a hammer weighing less than three pounds. That’s it. This is a 1950’s threat level. Modern thieves are going to come in with high-powered battery operated tools and cut into an RSC certified gun cabinet in less than 5 minutes. In the Video below I just about cut the whole side off of an RSC safe in less than 15 minutes using a tool for Harbor freight. These residential security containers are being sold as safes. They make them big and heavy and spend a lot of time talking about the doors and the locking systems. This is to give you a perceived level of security. Thieves, however, ignore the doors and locks and simply cut a big hole in the side. The hard truth about “gun safes” with the RSC certification is that they offer no better security than a basic gun cabinet and you are paying for a lot of useless weight and marketing. Looking at the stickers on two safes, one says 45-minute fire rating and one says 60 minutes fire certified. What does that actually mean? The answer is somewhat vague and unknown. These types of fire ratings are created by the gun safe manufacturers with no oversight. Each manufacturer has their own system. In the case of the Chinese safe, this is just a sticker and there is no testing done it all. UL Laboratories certifies safes with three standard class ratings. UL Class 350-1, UL Class 350-2 and UL Class 350-3. If your safe does not have a UL class 350 certification then it is not fireproof. I encourage you to do your own research. There have been several articles written on the subject. The data suggests that whether guns survive a fire in a safe, gun cabinet or wooden box has more to do with how the fire burns than the actual rating of the container that they’re stored in. RSC containers are being sold and advertised as fire-rated gun safes but per UL standards they’re not safes at all. They do not meet the minimum standard to be called a safe and the fire ratings are not independently verified. You’re buying a big, big heavy cabinet with a perception of security. The construction of most traditional gun safes is a container made from 11 to 16 gauge steel lined with drywall and covered with carpeting. To achieve a true fire safe rating, you need a 10GA steel container with a steel inner wall that is filled with a specific material – see image above. Drywall is used in RSC containers because it’s heavy and cheap. Despite the low-cost drywall is a poor choice for gun safes. Drywall contains formaldehyde used as a dispersing agent. Formaldehyde is very corrosive to steel, nickel, and copper increasing corrosion in a gun very quickly. You’ve also got bacteria in drywall. Almost all the drywall that comes out of China contains a bacteria called Acidithiobacillus. It doesn’t affect people, it eats iron and produces sulfuric acid. Have you ever noticed a sulfur smell when you open the safe door? That’s from bacteria and formaldehyde eating the metal in your guns. UL Laboratories will not give RSC – Residential Security Containers a fire rating because they don’t meet the basic fireproof standards. These gun cabinets are using materials that are detrimental to the long-term health of firearms. They are sold based on a myth that if you put your guns in a thousand pound gorilla they’re going to be safer than if they were stored in a steel cabinet. The data just doesn’t support their claims on fire rating and security and they use materials that promote corrosion of your firearms. The excessive weight and special bars and locks on the doors of traditional safes are promoted as a perception of security. The Model 52 is our ultra-light gun safe made of 14-gauge steel with patented Dedlock system. It ships flat and you assemble it with eight bolts. This patented system is as rigid and strong as any welded cabinet. The Model 52 Gun Cabinet is based on years of experience building weapon cabinets and armories for military units all over the world. We make no false or exaggerated claims to fire and security ratings. Our cabinets are as secure as any common gun safe sold in stores across the country but without the ridiculous weight. The Model 52 gives you a lightweight, secure cabinet that will provide proper storage for 6 rifles, handguns and a lot of gear. You can use multiple units throughout your home, to provide discreet security and fast access in a crisis situation. The average American moves every seven years. The Model 52 gun cabinet breaks down and moves with you very easily. SecureIt has designed modern cabinets to meet your modern lifestyle. Things are getting lighter, and easier to use, you don’t need to saddle yourself with a huge, heavy safe. Take some time to educate yourself so you can make an intelligent firearm storage decision and perhaps not end up with a thousand pound gorilla in the room. Yes, the Model 52 has pre-drilled holes on all sides except the front and the back. There are four holes on the top and bottom and six holes on each side. These mounting holes can also be used to stack the 52 on top of each other or to bolt them together side-by-side. Thanks for the comment and please feel free to reach back out with any other questions. I understand that a 14 gauge gun “safe” offers very little burglary protection. Most consumers don’t realize that you can’t even get something rated as a true safe (Class B) until you hit a minimum 1/2″ steel door! A 3/8″ thick steel RSC rated “safe” offers 126 times greater strength than 14 gauge steel. That’s a very broad range of steel strength in the RSC rating. To imply that anything that has an RSC rating can be opened with an 3lb hammer and an 18″ pry bar is a bit misleading. Also, a reputable gun safe manufacturer (I know you think they are shady characters and you’re probably right on most accounts) do offer some substantially superior fire protection that doesn’t use dry wall, e.g. ceramic fire blankets, fire clay and Palusol seals. .Granted, the Model 52 is far less expensive AND doesn’t make outlandish claims that many guns safe producers do but to equate the Model 52’s level of protection to ALL RSC rated safes is a bit dubious. I’m sure this product is a great value for the price but if a consumer does want a hard-to-crack safe and a lot of fire protection, such RSC safes are out there… but they do come with a substantial price. All in all, a very intriguing gun storage system. This will meet the needs of many gun owners! Should the cabinet be mounted or raised off a cement floor? It is not required. I military armories we bolt everything to concrete floors. If you are concerned about water or anything else on the floor you can use 4x4s or 2x4s under the cabinet. Bolt the wood to the concrete floor using proper anchors then lag bolt the cabinet to the wood. If using 2x4s I would stack 2 of them to give you enough depth for the lag bolts. If the concrete floor is uneven or pitched, use shims to square and level the cabinet. I have my cabinets on the floor. If you have a basement that could flood I would raise them. Ergonomically getting the cabinets up about 10 ” can be beneficial. Can you comment on comparison with SnapSafe Titan Gun safe which utilizes a Ceramic Fire Blanket as insulation and a 2300 degree 1 hour fire rating. On first glance, it appears to be significantly more secure than your safes, although not as easy to assemble. Richard, Thank you for taking the time to comment. That fire rating may not be what you think. As the title of our article state: “Are you being bamboozled?” That 2300 degree 1hr statement on their web site refers to the heat rating of the fire blanket material NOT OF THE SAFE USING IT! We think it is very misleading. To our knowledge Snap-Safe does not have a fire rating of any kind. If you consider their construction (watch their video) the steel panels are bent in a boxed “U” shape with holes for the bolts. This type of construction will transmit heat into the safe very quickly. Steel is a very good conductor of heat. I would recommend calling them and asking for fire rating certification documents. If their safe is rated they will send you the docs. I do give them credit for thinking outside the box with a modular design, but their fire statements are very misleading. Some of the dealers restate this fire rating as “2300°F one-hour Fire Shield protection” this is total BS and desinged to make people think they are getting something they are not. How much for the smaller safes seen in the pictures. ? That would be the Agile 52! It runs about $599 plus tax and shipping. Check out: https://www.secureitgunstorage.com/product-category/sporting/ultralight-gun-safe/ for more info! Thank you!